Your guides from New Zealand Safaris will collect you personally from Christchurch International Airport to start your trip with the care and professionalism that is second to none, while at the same time giving the hunter a true New Zealand hunting experience. about our New Zealand Safaris - Southern Slam package. For the hunter who loves a classic alpine hunting experience, the Southern Alps of New Zealand provide a spectacular backdrop for this combination hunt of the best Ovis and Capra species that can be found in the southern hemisphere. With private land access your ability to gain elevation by 4wd means that the hunt does not require the use of a helicopter, so all of your trophies will qualify for entry into the SCI, Ovis Grand Slam and FNWS record books. Four animals in 8 days make for a great vacation! 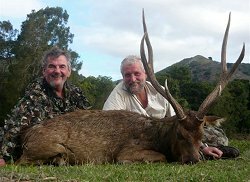 New Zealand Safaris still offer Game Estate based hunts that take place in a high fenced environment, but these hunts, while conducted on private land are 100% completely free range and definitely held under fair chase conditions. It is New Zealand Safaris' passion to hunt the wild New Zealand in a way that in the past was only reserved for true purist New Zealanders, without the use of helicopters and no high fences in sight. To guide overseas visitors on a truly unique hunt experience such as this has to be looked at as a great privilege that is very hard to find. The entire hunt experience is an additional trophy to the animals harvested. See our photo gallery for New Zealand Safaris. This package is designed to be an all-inclusive door-to-door package from Los Angeles inclusive of your flights from LAX, all meals and drinks, guided hunting days as well as all trophy fees. Download our flyer for New Zealand Safaris hunting packages.